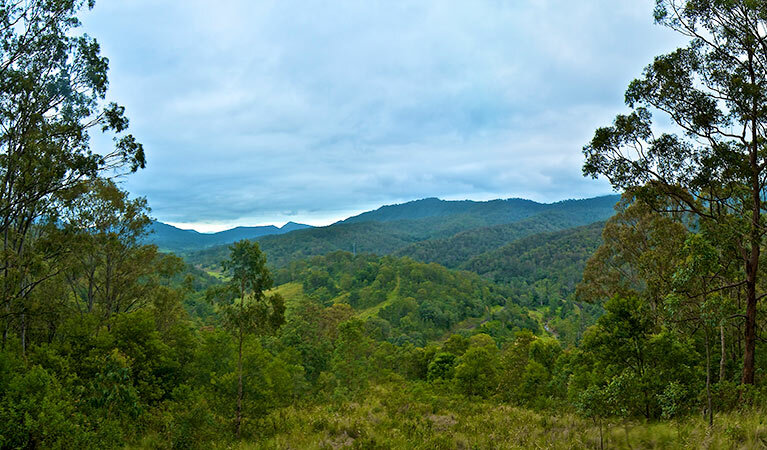 The NSW Border Ranges National Park is close to Murwillumbah and is Heritage Listed. There are activities such as hiking, cycling, 4×4 touring, camping and site seeing available within the National Park. Hidden Treasures located within the rainforest are scattered throughout the national park. Travelling through the national park via the Tweed Range Scenic Drive will give you a great feel for what the rainforest has on offer. There are great things to see along the drive including the occasional hike opportunity. The rainforest has great areas for picnics, BBQ’s and camping. Have your camera ready to capture the stunning wildlife and billowing waterfalls. The border Loop Walk can be found off the Tweed Range route. The walk is a total distance of 1.5km and is suggested to leave around 45 minutes to complete. The forest itself is home to a number of Koala’s, so be on the lookout and have the camera ready. Once you find yourself at the end of the track you will have a great view of Grady’s Creek Valley and the historic Border Loop Railway Line. It is a great place to have a BBQ or picnic. Forest Tops campground is located just off the Tweed Range Scenic drive, about 10km from the western edge of the park. Forest Tops campground is a great spot to set up camp for the night. The campsite offers barbecue facilities along with toilets and picnic tables. A total of 10 campsites area available. The campsite will set you back $6 per adult per night and 3.50 for kids. From Lismore, head north-west and follow signs to Kyogle for approximately 40km. From Kyogle, follow Murwillumbah Road for 30km north to Barkers Vale. The campsite will set you back $6 per adult per night and 3.50 for kids. The campsite has a total of 40 spots to pitch a tent.